Okay, so I didn’t enjoy Alice’s Adventures in Wonderland but I had a free audio of Through the Looking Glass voiced by Miriam Margolyes, and I thought, why not? Becoming a chess piece in a weird larger than life chess game is an intriguing concept echoed by a British BBC2 children’s TV show (Words and Pictures, I think) about 25 years ago, and later by J.K. Rowling with Harry Potter. Moving to each new square was an adventure into an unknown wilderness never knowing who or what you were going to encounter. 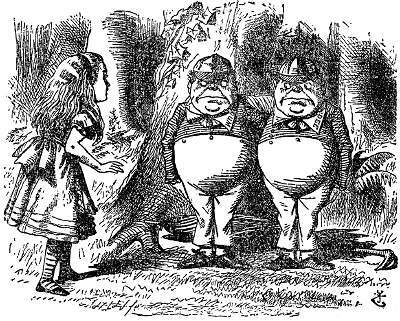 I was surprised at the appearance of Humpty Dumpty of nursery rhyme fame and a bit confused about the Red Queen. There are no red queens in chess, just black and white. And sometimes I mistook the Red Queen for the Queen of Hearts. I guess standard black and white was too bland for Carroll. Or too racist? But, again, I was troubled by the elaborate nonsense of Alice’s dreamworld. Call it what you will – gibberish, balderdash, hooey, malarkey, twaddle, tosh – it’s all frustrating nonsense. If there was an English translation of this little girl’s dreams perhaps I’d enjoy it more. Ms. Margolyes is the only reason I listened until the end. I’m still enjoying the art and games inspired by Carroll’s books. There are some colourful Alice in Wonderland chess sets.